Hello & Happy Saturday! 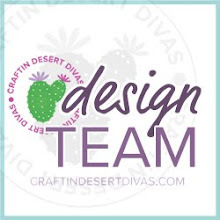 It's Jana from CHB Creations and I am super excited because today is my first official CDD Daily Post as a Craftin Desert Divas Designer. WooHoo!!!! 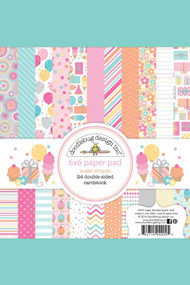 Have you checked out all the amazingly super cute new stamp sets and dies that have just been released? If not, then you need to head over to the January Release and take a look. 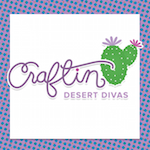 Trust me...you will not be disappointed!! 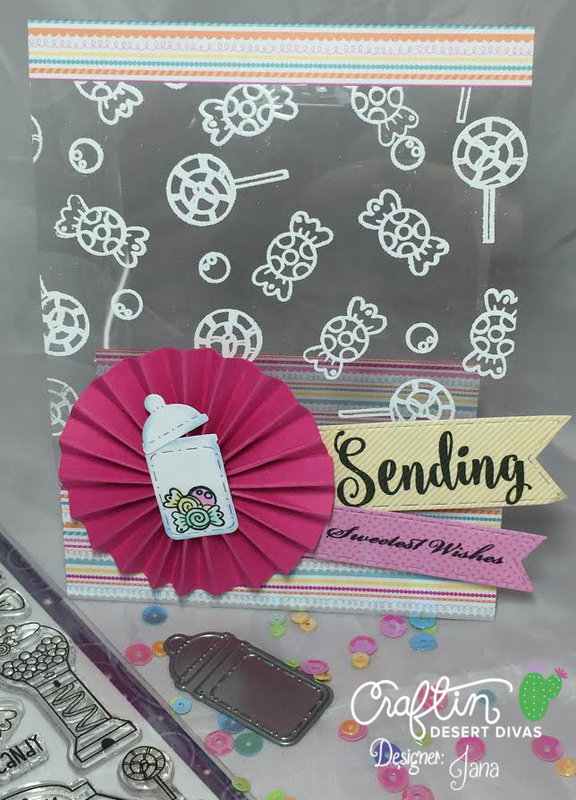 I started off by stamping my candy images using Versamark ink on a piece of heat resistant acetate. I then added my white embossing powder and heat set it. 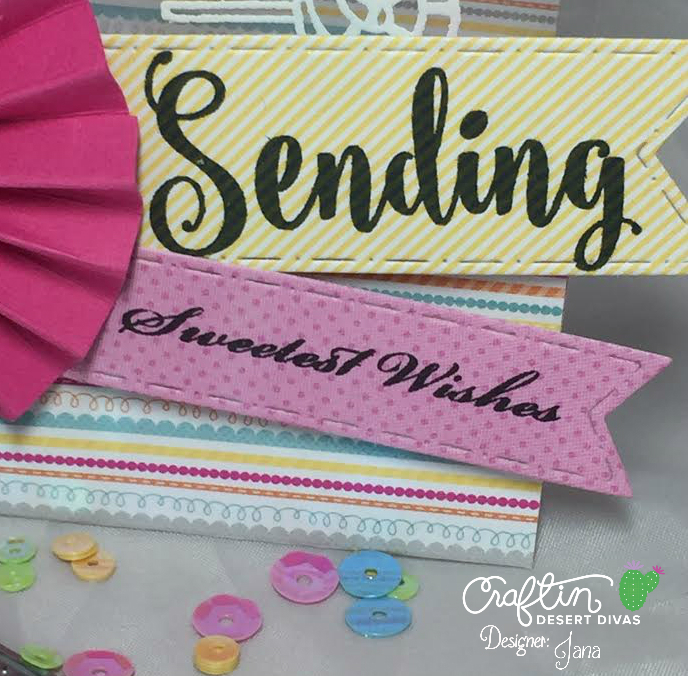 I wanted to add some cute patterned paper for that pop of color and also to give myself an area to write a greeting or note if I wanted to, so I chose some bright and fun paper from the Doodlebug Design Sugar Shoppe paper pad. I die cut my Candy Jar and stamped some more candy pieces on the jar and colored them in using Prismacolor Premier Colored Pencils. I then adhered my candy filled die cut jar in the center of a pink rosette I made using cardstock. 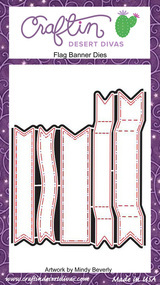 I then die cut two different sized banners using the Flag Banner Dies. 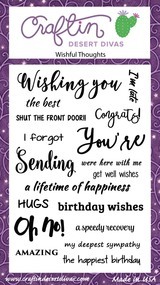 On the larger banner, I stamped "Sending" from the Wishful Thoughts Stamp Set. 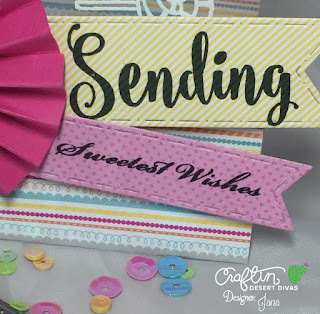 On the smaller banner, I stamped "Sweetest Wishes" from the Sweet Shop Stamp Set. I then arranged and tucked both banners underneath my rosette and adhered them into place to complete my card.